Roberto Espinosa had a lot of luck and one of the best trauma teams in Texas on his side when, on October 7, 2002, the bottom literally dropped out of his life. An ordinary ride in a restaurant freight elevator turned into a nightmare when a probable hydraulic fluid leak led the elevator to fail, plunging Roberto and several crates of produce to the basement three floors below San Antonio’s picturesque River Walk. Pure adrenaline compelled him to squeeze out of the mangled metal box and climb to the kitchen level; but once there, he collapsed. “I had no idea of the extent of my injuries,” he recalls. “So when I saw the paramedics rushing toward me a few minutes later, I was shocked.” With the precision exhibited by well-trained professionals, the first responders fell immediately to their task of strapping Roberto down, staunching the bleeding, and starting IV fluids. Before he knew it, he was on a gurney in an ambulance headed for Brooke Army Medical Center (BAMC), a Level 1 Trauma Center. Time stopped for Roberto as medical staff swarmed around him, but the trauma team was acutely aware of the passing minutes as they fought to save his life. A priest was called to administer last rites. It took two hours for them to clean and treat injuries to his head and a seven-inch gash down his back and staple up the wounds. It was in those two hours that the superbly skilled doctors and nurses realized that luck was also to play a role in Roberto’s survival and recovery. The gaping wound at the base of his skull was worrisome. Roberto might survive it, but would he be paralyzed? “I never believed I was going to die—maybe I was in denial—but I was terrified at the thought of being paralyzed,” he remembers. Today, the only lingering evidence of Roberto’s horrific accident is his refusal to walk over street elevator shafts—a superstition, he says—and a new life in a completely different and entirely rewarding career. 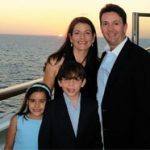 At 34, with a wife and two young children, Roberto took the accident as a wake-up call and immediately drew up a will, put his finances in order, and made sure his family would be protected in the event of his death. His thoroughness and attention to detail so impressed Northwestern Mutual, the firm he engaged for the work, that he was offered a job. And although he was co-owner of the restaurant in which he had the accident, he left the industry immediately. Now he still delights in helping people maneuver through the financial and legal tangles that often keep otherwise responsible adults from preparing for the unexpected. And he’s thanking his lucky stars and his trauma team for a new life that is completely balanced and happy.